A whole generation has passed since November 4, 1979, the date on which a violent mob stormed the American Embassy in Tehran, Iran. That started what has become known as the Iranian Hostage Crisis. As the captivity of 52 Americans dragged on and on, Tom Flynn, owner of Hillcrest Memorial Park in Hermitage, PA, felt compelled to do something significant to focus attention on that outrageous situation. He raised one American flag, surrounded by the fifty state flags, at the entrance to the Park. When the captivity dragged on past three months with no resolution in sight, he felt compelled to do more. The community of Hermitage and beyond stood firmly with him. Wheatland Tube donated the flagpoles and the United Steelworkers International Union Local 1660 put them up along the avenue leading into the Park. On the 100th day of captivity, in a ceremony attended by a thousand patriotic citizens, Harry Matrinko, father of hostage Michael Matrinko, raised the 100th flag. The 101st day dawned without a resolution to the crisis. So another flag pole was erected to fly another flag. One more was raised every day the crisis went on past 200, 300, 400 days. Three rows of flags continued up the Avenue and around the circle that now holds the War on Terror Memorial. The last flag was raised on January 20, 1981, 444 days after the embassy had been surrendered. The effort was successful in helping to keep the crisis in the minds of people across the country and others around the world. The growth of the Avenue was featured in national and international media. 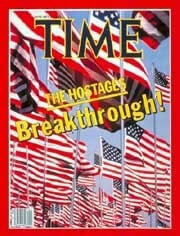 The editors of Time Magazine chose a photo of the flags as the most appropriate image for the cover of its magazine on January 26, 1981, its first issue after the hostages had been released. Supported by the Avenue of 444 Flags Foundation, more than 18,000 replacement flags have flown along the Avenue as a reminder that freedom isn’t free, and as a tribute to all men and women who have served in the armed forces of the United States of America. On November 11, 2012, the Avenue took on new significance with the first interment of veterans in the Cremation Garden within the flags surrounding the War on Terror Memorial. The cremated remains of any veteran who has served honorably, as well as members of their family, can now be interred in one of the most beautiful and patriotic acres in America.